Note: This chilled asparagus dish was inspired by Coco restaurant in San Francisco. It is light, refreshing and delicious! Be careful not to overcook the asparagus spears! Heat a large pot of salted water until boiling. Add asparagus and cook until just tender, about 2-3 minutes. Drain. Refresh under ice cold water and drain and dry thoroughly. Cover and refrigerate until cold. In a small bowl, mix together mayo, garlic, mustard, 2 tbsp lemon juice, salt and pepper to make the aoili. Remove asparagus from refrigerator and carefully toss with remaining 1-2 tbsp of lemon juice and salt. For each serving, lie asparagus in one direction on a salad plate. Top with a pile of crab meat. 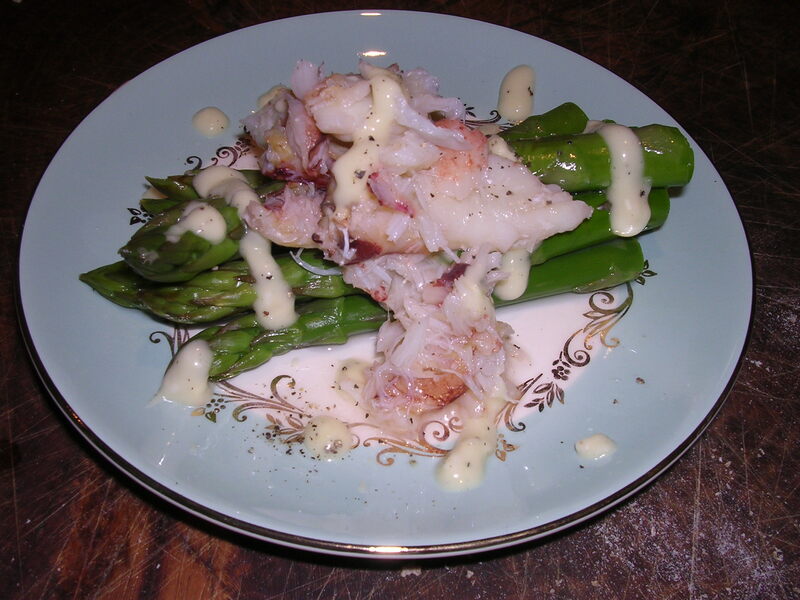 Gently spoon aoili over the asparagus and crab. Sprinkle with fresh pepper. Serve!